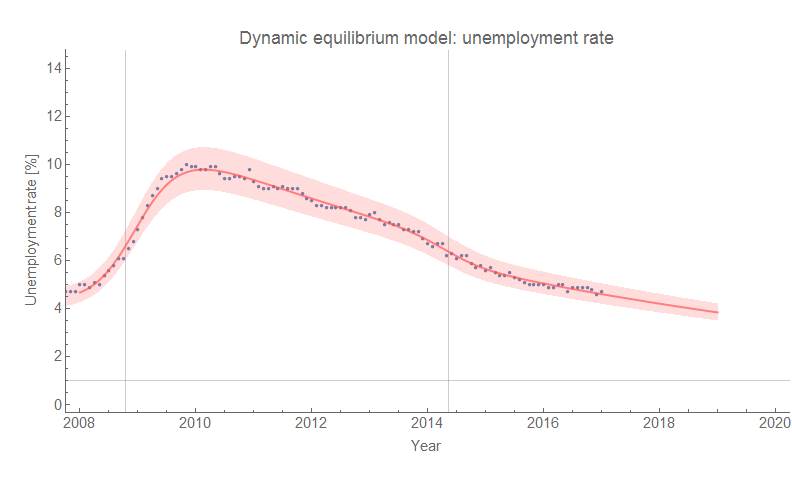 The recession shocks aren't really predictable in either model ‒ they appear to be a random Poisson process with λ = 0.126 y⁻¹ ~ 1/(8 years). You can only tell when there starts to be a deviation from the linear (or log linear) decline. 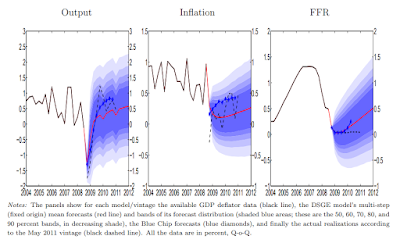 The interesting thing is that in either model we shouldn't expect the flattening out over the two year period we see in the FRBSF model. We should expect either 1) a recession to start raising unemployment, or 2) a continuing decline (albeit at a slower rate). A constant unemployment rate won't happen, and in fact generally doesn't happen . We might be able to test the various models here . Anyway, this is how science gets done. It's a lot of vague guesswork made under uncertain conditions. The "metastable" states don't appear to last that long. 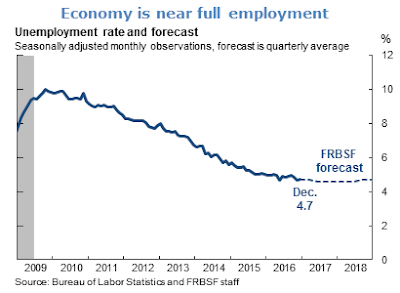 There is a possibility of a "perfect storm" of a very broad (slow rolling) shock combining with the downward trend yielding a relatively constant unemployment rate. The likelihood that the parameters would work out just so is pretty low, however. Additionally, this perfect storm only thwarts forecasting. After the shock is about half over, we will be able to determine which model was more effective. What about the S&P 500? 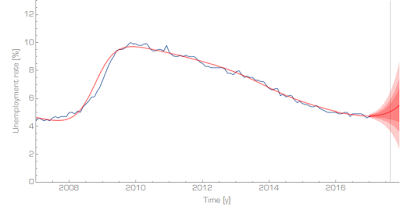 Dynamic equilibrium in an agent based model? 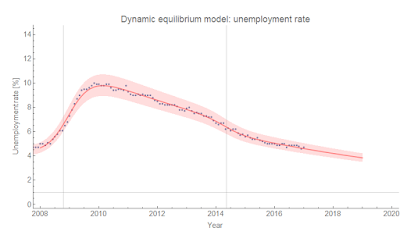 A dynamic equilibrium in JOLTS data?